To cut, is a process we use over and over again in our daily lives. It has many different meanings and can be both a verb and a noun. Cut can mean to pierce sharply; to divide into parts, to reduce, to stop or to make a sudden shift. It can also mean to remove or exclude from something larger or to make a design in a particular way. 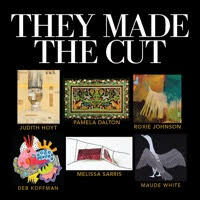 The six local artists exhibiting each use cutting as an integral role in creating their own unique artistry. The artists include; Pamela Dalton (Hillsdale, NY) who is a master in Scherenschnitte, a form of continuous paper cutting often creating traditional motifs; Judith Hoyt (Rosendale, NY) who transforms salvaged scrap metal, wood and bits of old paper and fabric into sculptural figures, jewelry and mounted collage works which often incorporate encaustic painting; Roxie Johnson (Hyde Park, NY) a mixed media artist fascinated with surface qualities; Deb Koffman (Housatonic, MA) whose lighthearted and inspirational work on and with paper can be seen in small table top sculptures and large installation art; Melissa Sarris (Chatham, NY), a quilt maker with an interest in participatory and collaborative work; and Maude White (Hudson, NY), a paper cutting artist who works both on the macro and micro levels. Her new book, BRAVE BIRDS was just released by Abrams Books.